Critique of "Let's Ban the Eighth Waste"
Perhaps untapped potential is used in a lazy way to cater for many new or service related wastes and it even has its own acronym – DOWNTIME. Comment: In 1996 I discovered what I saw as the eighth waste: “behavioral waste.” In 1998, I described this in detail in my award-winning paper “Lean Behaviors.” I defined behavioral waste as leadership “behaviors that add no value and can be eliminated.” The reason why I identified “behavioral waste” as the eighth waste, and not “untapped human potential” or similar is because leaders’ behavioral waste lies at the root of real problems such as untapped human potential, under-utilizing employee skills, or unused creativity. In other words, if you do a 5 Whys root cause analysis of “Why is human potential untapped?”, you will discover that wasteful leadership behaviors is the root cause. 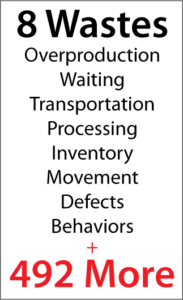 In addition, behaviors is a waste that clearly and directly connects to the “Respect for People” principle, and it is one of several important root causes of failed Lean transformations. Why this has been added is probably to do with a lack of a human dimension in Taiichi’s original seven or maybe some feel compelled to be innovative or personalise the list in some way. But how useful and helpful is adding this particular ‘waste’ to the list and, indeed, is it actually a real waste? Comment: In my close readings of Taiichi Ohno’s books, as well as books by his contemporaries (e.g. Eiji Toyoda, Seisi Kato, and Shotaro Kamiya), I find abundant references to the human dimension in production and in business. In particular, how leaders and other people behave, often in ways that undercut collaboration and teamwork, and which disrupt harmony, flow, and mutual prosperity. If one is not looking for the human dimension, then it is invisible to them. The waste of “untapped human potential” was added in recent years in response to the empirical observation that Lean transformations were not as successful as hoped for or failing, and how leaders treated and engaged people in Lean was seen as the principal problem. It is indeed a problem, but it is not the root cause. Behavioral waste is the root cause, and it is a bona fide eighth waste. Wastes were originally identified to be those activities that should be removed from the operation or process because they added no value for the customer; typically, they impeded flow, caused a problem and/or affected quality. They were clearly identifiable, quantifiable and removable with consequent positive benefits to quality, cost or delivery. Part of their popularity and success was, arguably, due their simplicity in understanding and usability by anyone in the workplace. Comment: I agree completely with Simon here. Leaders’ behavioral waste is clearly identifiable, it impedes material and information flow, adds no value for customers, can be removed from processes, and contributes to cost reduction, quality improvement, and reduction in lead-time. In my many years of teaching Lean leadership, it is clear that anyone in the workplace can understand it and contribute to its removal. So where does the waste of unfulfilled human potential fit in? Would you be able to spot it through those glasses, and if you were, could you then remove it and see an enhancement in customer value, better process flow or quality? Has anyone actually claimed that they have reduced untapped human potential from, say, 67% to 38%? The answer is, of course, ‘no’ and it is nonsensical to suggest you could highlight it with a red Post-It on a brown paper map and then work out how to reduce or remove it. Comment: Again, I agree with Simon here. But, behaviors are only part of the story. Further study reveals the existence of antecedent and descendant relationships that surround “behaviors.” The relationship is: Beliefs –> Behaviors –> Competencies. I describe these important relationships, and the significant ways in which they differ between conventional and Lean leadership, in the workbook Practical Lean Leadership, and in relation to the “Respect for People” principle. However, if this particular eighth waste should be removed from the list, it does not follow that the list should be permanently restricted to just seven; indeed, there’s a case that the list should have no particular limit. Comment: Taiichi Ohno would say that even if you have eliminated all seven wastes, there are 493 more wastes. There is nothing magical about 493. 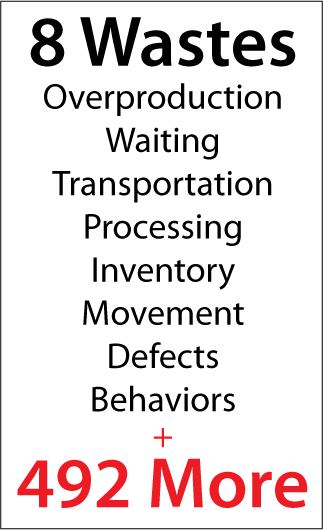 It is symbolically representative of “many many types of waste.” With kaizen training, we can begin to see the seven wastes. Once we learn how to see these seven wastes, we can, with practice, begin seeing an 8th, 9th, 10th, or 493rd waste and beyond – wastes which were previously invisible to us. Ohno’s insight, 500 – 7 = 493, is meant to make us think and think deeply. The 493 types of waste are not contained within the original 7. In addition, we must never forget about the existence of the many forms of unevenness and unreasonableness contained within and outside of the eight (plus 492 more) wastes. Lean transformation processes often fail because people busy with gemba walks and creating value stream maps and A3 reports don’t actually eliminate waste, unevenness, and unreasonableness. Instead, they should be practicing Toyota-style, industrial engineering based kaizen. Does it add no value for the customer or stakeholder? Can to be removed or reduced? Does its existence impede process flow in some way either directly or indirectly or create inefficiencies? Is it quantifiable, so the benefit of its reduction can be measured? Can those working in the value stream, such as front line staff, have a role in identifying, reducing or eliminating it? A yes answer to most of these will probably qualify it for inclusion in a waste list that is a real call to action, either as a non-value adding or a necessary non-value adding activity. Comment: The five criteria listed above is a good way to discern if something is waste or not. Leaders’ behaviors certainly fulfill each of the five criteria, but untapped human potential does not. So we must be careful; it is sensible to ban untapped human potential as an eighth waste, but not behaviors. Finally, we must open our minds and begin to comprehend leadership in a completely different way, as processes. Only then we can move beyond behaviors to a more effective method for developing and improving leadership. If you have consulted with fabrication shops or construction sites (places where there is considerable hard work, heavy lifting, etc. ), try asking the employee who is lifting and carrying large pieces of sheet metal, either off the plasma cutter or for folding on the brake press, if he would benefit from practices and systems that would reduce that type of work. I can assure you that their response will right there justify the waste of NOT asking your employees how they could, or would, like their work place to be ergonomically improved. Bob, I left a comment on LinkedIn. I won’t repeat what I said there. But I noticed that you use a term “respect for people” and I found that interesting. Because I was doing work in my training to get teams off 5 people to find $100,000 of waste that could be fixed for $2000 (50 to 1 ROI – did intense analysis of results of 800 employees at 23 companies and the results were 38 to 1), most employees weren’t going to say anything lest they get in trouble from some management “idiot”. So I trademarked “No Blame” as a way to sponsor “Change without reprisal.” And it worked. I sold the CEO first and s/he usually bought into it. I could never do what I did without “no Blame”. Just a few thoughts. I can send you pdf copies of my books: I have written 5. Yes, the phrase “Respect for People” comes from The Toyota Way 2001 document. RP and no-blame are certainly fundamental prerequisites for people to want to become engaged in continuous improvement.